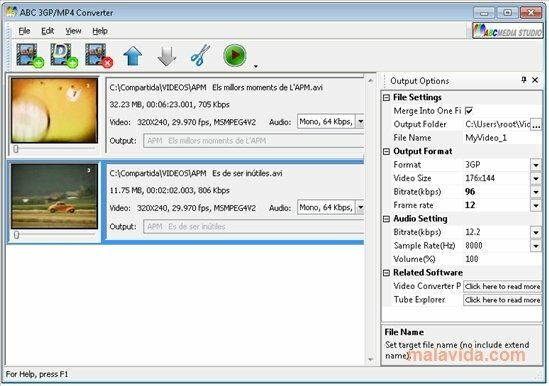 ABC 3GP Converter is a software application that will allow you to convert video files to 3GP to be able to view them on a mobile, MP3 player or any other portable device. The small size of the 3GP files, together with the quality that the image can reach make them the perfect format to be played on portable gadgets. 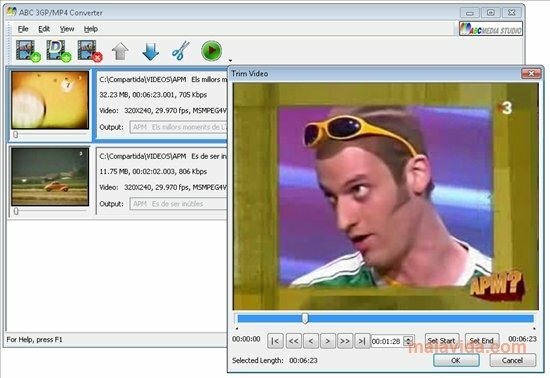 Thus, with ABC 3GP Converter we will be able to have the videos ready to transfer them to players or mobiles. - Quick conversion of any video. - Allows you to join various video clips. - Possibility to crop video clips. - It's possible to turn off the computer automatically when you finish the conversions. Thus, if you want to convert videos for a mobile, PSP, iPod, MP3, MP4 or any other kind of player compatible with 3GP videos, thanks to ABC 3GP Converter, also known as ABC 3GP/MP4 Converter, you'll be able to do so very quickly. Download ABC 3GP Converter for free, one of the best free video conversion applications to be able to view videos on your mobile.